It’s been a while since I really checked in so I thought I’d give folks a look at what has been going on in the world of the Council Of Fools. First and foremost continues to be Ehdrigohr. I’m still writing it and developing it though I’ve hit many big and small snags along the way. There is still an adventure forthcoming though at this point I have to admit I’m probably obsessing over it a bit but it’s taken me on an interesting journey. When I started Runs the Rabbit, Bleeds the Sky I had all sorts of lofty ideas about what it would be. 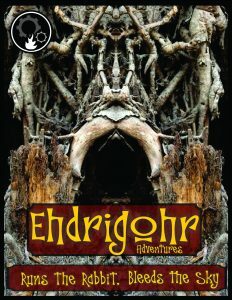 Unfortunately, I realized that in the hubbub of getting Ehdrigohr out the door felt I had also rushed the first adventure out and it wasn’t what it should have been. I thought with the second one that I would scale things back a bit and make it really fit the big ideas of the game (or at least some of therm). My first pass at it was a functional adventure but it didn’t capture anything more than being a monster hunt. I found that, in the urge to be done, I was reverting back to relatively safe stuff. There was so much of the game I wasn’t doing a good job of showcasing – cultures, sorrows, struggles, societies and political relationships. So I pulled it back in and took it back to the drawing board, deciding I would make it showcase one of the cultures of Ehdrigohr. Since it was focused in the Salduun Wastes the obvious choice was the Salduun Empire. I began really trying to build out life in this space and gathering art. What also happened was I began playing the game more with strangers than I had ever done. 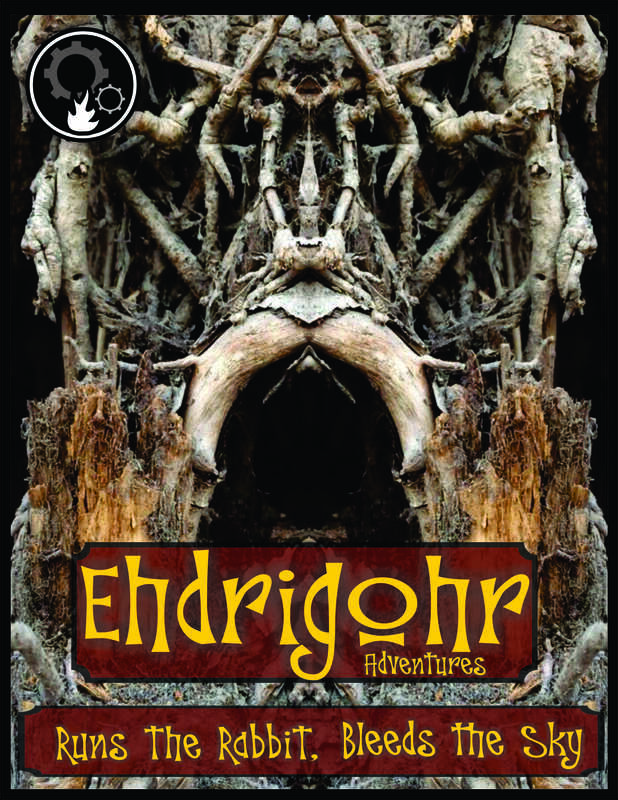 As I did that it became evident that there were issues with rules I needed to clarify more and I needed to really exploring the various narratives that were underlying in the idea of Ehdrigohr. I got fixated on the idea that the only way to connect people to these ideas was to give them rules around them so they always had to engage them. That didn’t work. It was always too much to explain and way too heavy handed. it gave people no room to find their own place and pace with the cultures and shoehorned them into a more dogmatic way of playing. So, I scaled it back again and rewrote trying to find an even, middle ground. In the meantime I became distracted due to actually playing the game with people and talking about their experiences and working – a lot. That slowly sucked up time (in addition to teaching) from my writing until I really wasn’t doing much of it beyond curriculum stuff. I had a ton of notes about things I wanted to change to make the game more accessible to people and kept telling myself I would find time to figure it all out and time continued to slip by. I’m revving back up into full on writing. It’s funny though to get there. I found I had to take on some side projects that were writing intensive to get my Ehdrigohr juices more aligned. My brain had gotten stuck and so I returned to doing the very kind of thing that got Ehdrigohr’s juices flowing the first time around. I opted to write for another game. I’d made connections with various writers who worked on the World of Darkness game lines and was offered the opportunity to play in their playgrounds a bit and took them up on it. I’m writing with Onyx Path on a number of their books. Most notably Scion 2nd Edition where I am the author for the Manitou pantheon which is a Native focused collection of deities. I’m also working on Hunter the Vigil. More info about this can be found here. Working on these nourished various ideas that I wanted to feed back into Ehdrighor. One flow has fed another and opened up all sorts of thoughts about how to move forward. So what I’m going to do is just make the adventure available as a play test text document for free for a while. It will be all text, free of art and such so that anyone who wanted to try to play with it can just play with it. When they’re done they can give me feedback on what more they’d want to know as game-masters to make it a successful adventure and sourcebook. Then I can take that feedback, reconvene with my artists, and finally get it out the door. 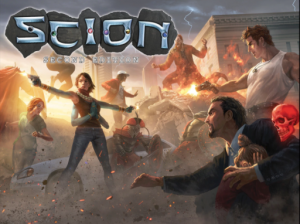 If you’re interested in playing with the adventure you can contact me by commenting on this article to get a working copy and a feedback form that I’ll need you to fill out. While that percolates, something else that is forthcoming is an Ehdrigohr Fate deck of sorts (I don’t know yet what it will be called). It is meant to replace and/or supplement the dice rolls with additional mechanics that add to the narrative play of the game. It won’t just be a collection of cards meant to simulate the roll of Fate Dice. They’ll serve other purposes that support the usage of aspects and creation, and maintenance, of advantages. I landed on the idea after playing with the Deck of Fate an watching how people engaged the game. There was this weird problem of keeping track of aspects and advantages in play and getting people to use them and metabolize the experience of telling story. The cards became my answer for giving people some tangible and visible shorthand for what is actively going on at any moment in the narrative. While I was trying to figure out how best to use the cards to create more interesting narratives, something else came to life. That something is a thing I like to call the Arboretum Imaginarium. 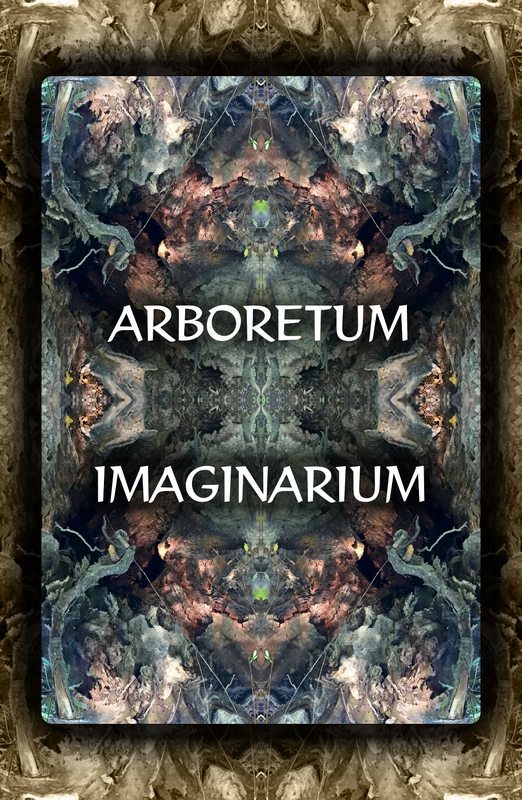 The Arboretum Imaginarium is a tool for playing with narratives. It is the love child of myself and artist Stacey Taheny. I had approached Stacey about using some of her art for the cover of the Runs the Rabbit adventure but when I looked at the range of images she had created it caused my mind to stir. As I worked on Runs the Rabbit we revisited the images many times and we felt there was something more to be addressed there. As I moved into playing with ideas for rituals and procedures that would allow the use of cards to enhance the storytelling experience my attention was drawn back to these images as storytelling devices and we began to, at first collaborate on the Ehdrigohr deck, but realized there was another thing trying to be birthed first and so we went with it to see where it took us. 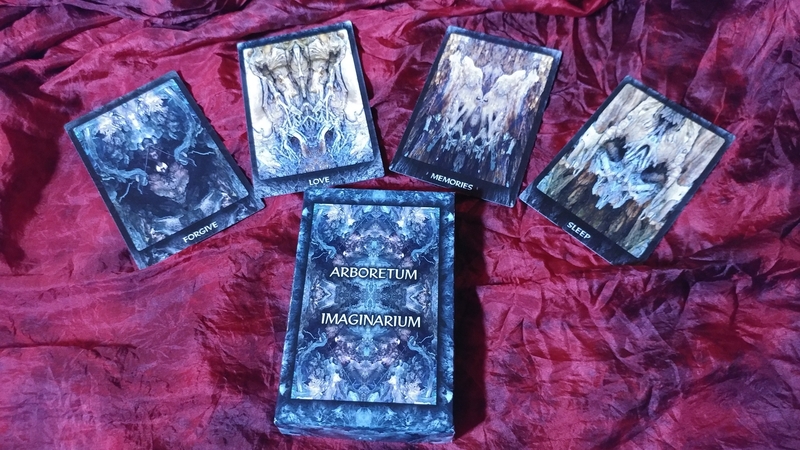 The result is the first incarnation of the Arboretum Imaginarium which uses these wonderful images and words in combination to initiate conversations about how and why one perceives the narratives around them. We’ve been using the the services of The Game Crafter to prototype and develop the tool. Now we have a version that we like enough to release to people. This version is a deck of cards with these beautiful images coupled with words that instigate creative thought. We intend to provide some support here on the blog for the many ways that the cards can be used. You can purchase a deck of the cards here and find out more info about them on the Arboretum Imaginarium page. There is another, expanded, expanded incarnation forthcoming on the horizon for this tool. The expanded version really opens the idea up and gives much more agency to users and participants. It separates the words from the cards, creating more involved rituals and layouts, with focus on facilitating a person through the naming of their experiences and narratives. We’ll be showing off both versions at a variety of festivals and cons this summer and fall. If you’re interested in a session with the cards reach out to us or come find us and arrange a sit down. Stacey will be debuting them at the Midwest Women’s Herbal Conference in June. In the long run I intend to bring these cards back into the experience of Ehdrigohr. If you’ve read through the blog, you’ve probably seen the article about the medicine society known as the Rooks. The Rooks have a variety of tools that they they use to separate a person from stories that they hold which are too heavy to bear. These cards are nod to that idea. While the Rooks have a host of tools, rituals, techniques, and mysteries to bring to bear the real goal of what they really set out to do is to get people looking at the relationships they have built with the narratives in their lives, while looking at said narratives like forces as powerful as the wind and gravity. I think we’ve captured a bit of that experience. The cards are fun and a bit unnerving to use. It’s all about agency and ownership. I’ll be posting shortly on how to use them as part of character creation, and building winter counts, in Ehdrigohr. I should also note that Stacey’s brilliant and powerful images from the cards, as wells as images and maps from Ehdrigohr, are available in the Council Of Fools Shop as prints that you can order. Not only have I been working and playing with all of these bits and pieces. I’ve been all over sharing Ehdrigohr and learning more about it myself. This last year I was lucky enough to sit down with Skawenatti and Jason Lewis and their team at Aboriginal Territories in Cyberspace. I was there as a part of the ABTEC project called the Initiative For Indigenous Futures and their Future Imaginary Dialogues. I talked about Ehdrigohr and my journey with it. You can view that here. Future Imaginary Dialogues: Allen Turner from Obx Labs on Vimeo. There was also a general lecture about the creative thoughts behind Ehdrigohr here. Future Imaginary Lecture: Allen Turner. “Ehdrigohr: Designing Alternative Indigenous Timelines Using Role-Playing Games” from Obx Labs on Vimeo. Finally, I had the opportunity to present and teach game design to local native communities at the first Indigenous Comic Con at the end of 2016 in Albuquerque as well as a lightning talk on Indigenous Game Design at GDC 2017. I hope to participate in the Indigenous Comic Con again this year. As this school year closes, I had the opportunity to be on a panel with the illustrious Elizabeth LaPensee and Jason Lewis on the web show Meeple Syrup with focuses on conversations in game design. As I enter this summer, my hope is that it will be overflowing with creative output. All of this playing the game and talking to people about Ehdrigohr has led me to really dig deep into the notion of doing an Ehdrigohr podcast. I’ve assembled a group of friends who I’ll be taking on adventures through Ehdrigohr. I figured that would be useful so that people could see and hear how the game is played and experienced. I’ll keep information flowing about the adventures, podcasting, Arboretum Imaginarium, and the Ehdrigohr narrative deck as they become more and more solid realities. 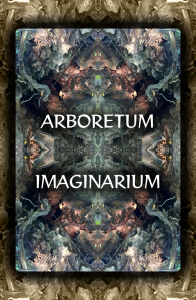 Arboretum Imaginarium, Art, Aspects, Ehdrigohr, Expansion, Featured. Bookmark.